I've been enjoying the hell out of reading all the vintage UFO literature my friend Cxxx dropped off over the weekend. 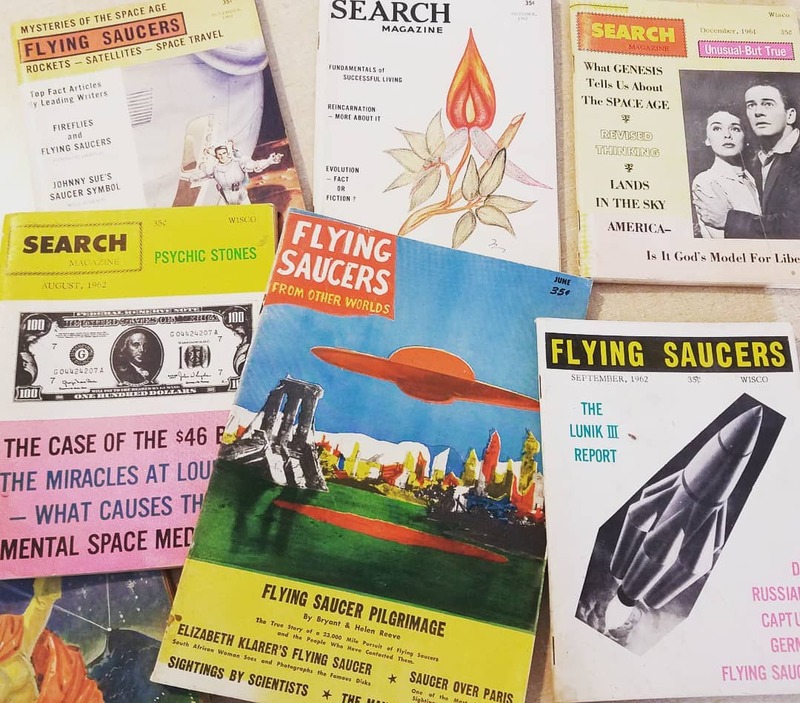 Most of the magazines are issues of Search magazine and Flying Saucers (From Other Worlds), all published between 1957 and 1962 by Palmer Publications of Amherst, Wisconsin. 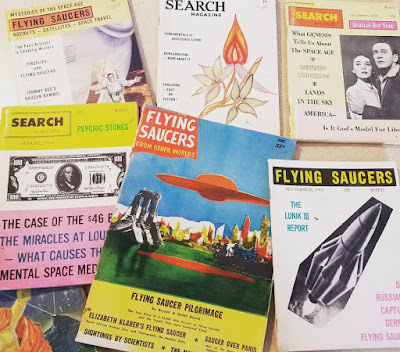 There are all sorts of pleasures to be found on the pulpy pages of these old magazines -- sensational reports of true UFO encounters, treatises on complicated conspiracy theories, fuzzy pictures of unidentified flying blobs, and the enthusiastic carnival-barker musings of the irrepressible publisher Ray Palmer -- but, to my surprise, I keep finding myself drawn to the sections of the magazines designed to make connections between UFO buffs reading the magazine. The N.J. Association on Aerial Phenomena is proud to announce the completion of the third issue of The UFO News Bulletin, its official bulletin. Sample copies may be obtained for 25 cents. Membership is $1.25 in U.S. and $1.50 elsewhere. NJAAP is willing to mimeograph. The Research Organization of Aerial Phenomena is unique in its sound, scientific investigation of the UFOs, and its exceptionally excellent bulletin, The UFO Sighter. The token membership fee of 50 cents per year is all that is required to become a member of this vital organization. 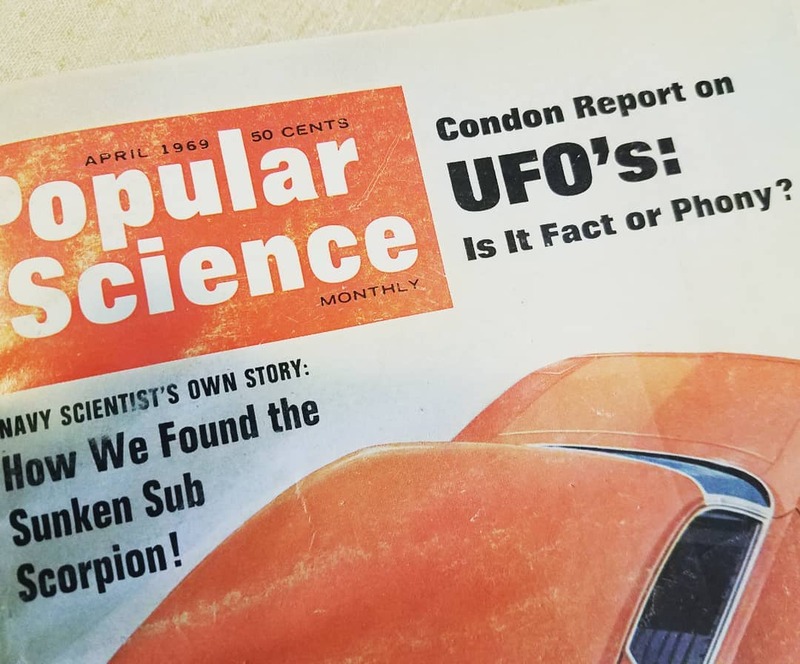 Important: In the last issue of this magazine it was stated that the Flying Saucer Research Organization would charge no dues. After approximately 3 months of this we find it impossible to continue any longer. The dues will be 50 cents per year. ATTENTION UFO CLUBS: The National Aerophenomena Research League cordially invites all UFO clubs to inquire about this new service. The N.A.R.L. is a group of UFO clubs working in cooperation with each other, exchanging ideas and information... So why not join N.A.R.L. 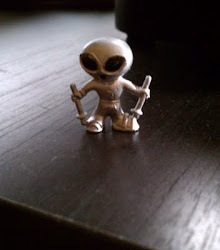 and help UFOlogy "pull itself together?" There is nothing to lose. If you have ever seen a flying saucer, or have been inside one, or talked with anyone from outer space, or have similarly interesting experiences, please write: Jxxxx Hxxxxxx, The Steve Allen Show, The Steve Allen Playhouse, 1228 N. Vine St., Hollywood, California. I am a writer-talent coordinator for the show, searching for interesting guests for Steve to interview. Want to purchase, rent or borrow book by George Adamski titled My Trip to Mars, Moon and Venus. Any readers who can write or know of people who can write interplanetary languages are invited to send samples of script to the Interplanetary Research Society. Readers who can speak interplanetary tongues are asked to send samples of speech by tape. I would like to write to anyone who is interested in the saucers, and who may have an idea explaining why they are here. I believe they are here to help us, although their motives may not be all kindness. I am also extremely interested in writing to all those who ponder on the nature and composition of Time. I would like to discuss time travel in some detail with those who know something about it. I also have a ouija board for sale; best offer. Why do I feel so drawn to these postings? Is it because they resonate like lonesome voices crying out in the night? Also, I really wonder why Janice K. was in such a hurry to unload her ouija board. I don't mean I took a trip on a UFO, I mean I've been on a crazy trip fueled by some dazzling, dizzying UFO questions hurled at me from some very unexpected sources. 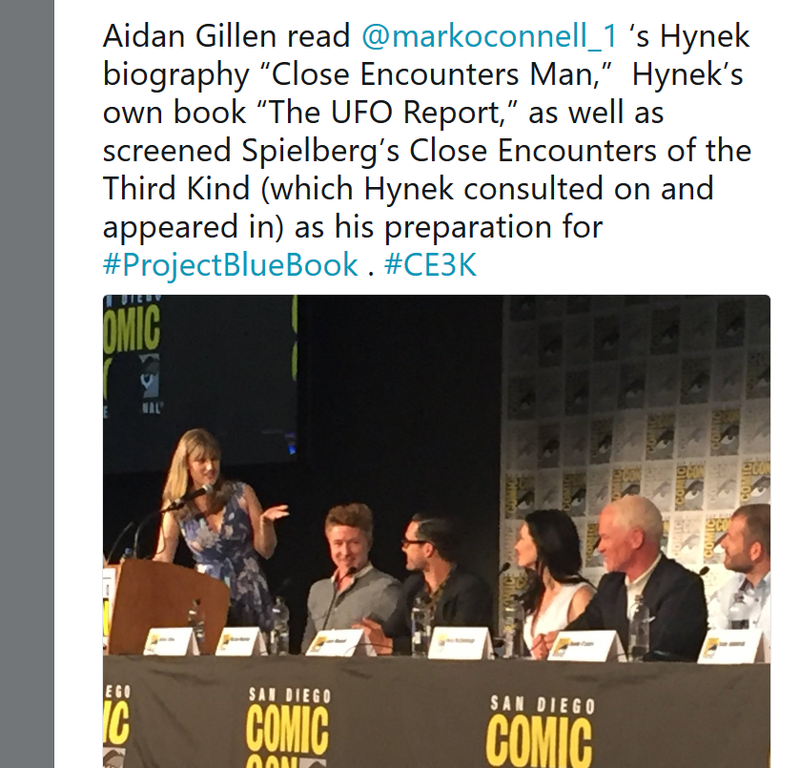 It all started yesterday morning, when I did a live Skype UFO Q&A call with some graduate students at Rice University in Houston, TX who have just read my biography of Dr. J. Allen Hynek, The Close Encounters Man. These Masters and Ph.D. candidates are taking a class in the Department of Religion entitled "Archives of the Impossible," and they were ready with an hour's worth of very deep, very serious questions about Dr. Hynek, UFOs and religion. It was an entertaining experience, and quite kick to know that my book is required reading for a Ph.D. level course! 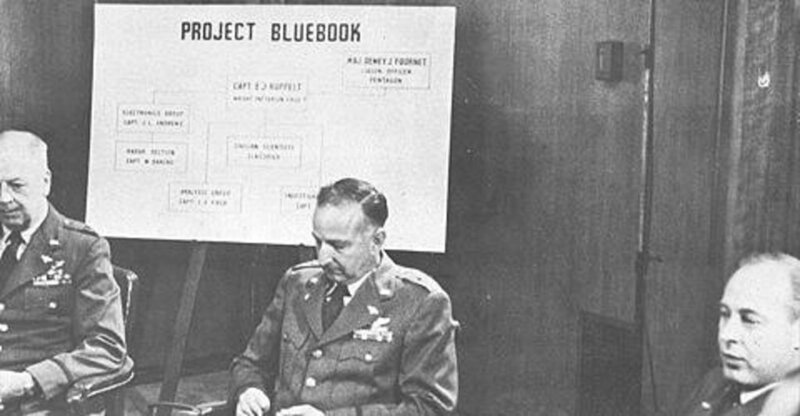 Project Blue Book: Terrible UFO TV Show? or Worst UFO TV Show ever? I got a surprise email from Leslie Kean, author of the hugely influential 2010 book UFOs: Generals, Pilots and Government Officials Go on the Record, asking if I could fact-check some information about J. Allen Hynek for an article she was writing for the New York Times. Of course I said yes -- Leslie has been very generous with her time when I've approached her in the past, and I was happy to be able to return the favor. 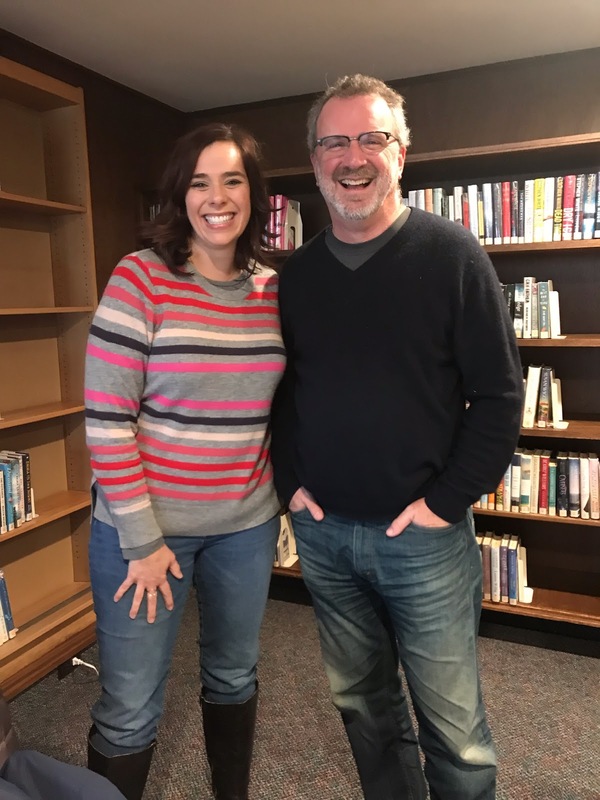 Imagine my surprise when Leslie told me she was writing an article pointing out the inaccuracies in the History Channel Project Blue Book TV series that just premiered last week! What a wonderful shock: She has as big a problem with this show as I do, and she's going to say so in the New York Times! Halleluja!! Do you know if Hynek ever saw a UFO himself? Yes, two, in fact! One from an airplane and one from the pier at his cabin in Canada. Did Hynek ever crash in a plane while recreating a UFO dogfight that had been reported by a pilot? That's a big NO! Did Hynek ever see what looked like an alien body floating in a tank in a secret facility, and take photos of it? That's an even bigger NO! Did he ever meet Wernher Von Braun? MAYBE. Hynek determined the payloads on the launches of the Nazi V-2 rockets that we appropriated after the war, so it's possible that he came into contact with some of the "Peenemunders." But I think if he had met Dr. Von B there would most likely be some record of it...? 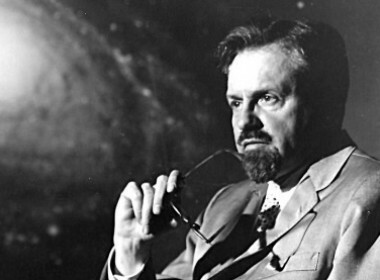 Did Hynek ever watch as a UFO witness douse himself with gasoline and set himself on fire? Are you f***ing kidding me? That's in the show??? When I expressed disbelief at the "UFO witness setting himself on fire" question Leslie kindly filled me in on the contents of the first six episodes. I've only seen the first, and it was pretty awful, but apparently the rest of the episodes are far, far worse. You can read Leslie's article here. It's a good first step towards blunting the impact of Project Blue Book and making sure the real UFO story is heard. So, yeah, I'm in a bit of a daze, and I'm not sure when it will let up... And I know for a fact that Dr. Hynek is rolling over in his grave. What a great way for the New Year to start! 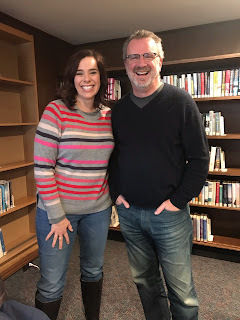 A few weeks ago I did an interview with my new friend Beth Mund for her super cool podcast Casual Space, and Beth has just posted the interview here. Even better: We did the interview in a library! Beth is a former NASA public affairs officer, a self-professed "space geek" (and a graduate of NASA's Space Camp! ), and her podcast is an entertaining look at space science and space exploration done in a very friendly, conversational, casual style. 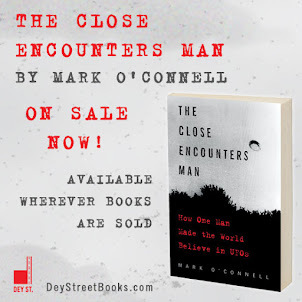 I was thrilled to be invited to do an interview for Casual Space, because I've always wanted my book The Close Encounters Man to be seen as a science book as much as a UFO book, and because Beth is such a great interviewer I knew it would be a really fun experience. It was! So, our interview gets posted over the weekend, and then yesterday I get a phone message from a gentleman I have never met who had just listened to the podcast the night before (at 3 a.m., to be exact), and he says he has something he wants to send me... Well, things could go off in many different weird directions after that, but I took a chance and called him back, and I'm glad I did. It turns out this man was was a former investigator for Dr. J. Allen Hynek's Center for UFO Studies (CUFOS) back in the 1970s, he had some personal contacts with Dr. Hynek during that time, and he has loads of archival material that he wants me to have. "I'm getting up in years," he told me, "and I want to make sure this material is in the hands of someone who can make good use of it." I am still stunned by yesterday's phone conversation. I had taken it for granted that all of CUFOS's records and case files were stored in the "official" CUFOS archives in Chicago, but now I know there's one other trove of CUFOS documents in a different city, and if there's one new trove there may be many more. CUFOS has had operatives all over the country and all over the world, so it stands to reason that there may more private collections of documentation out there that the CUFOS people don't even know about. I cannot wait to see what my new friend is going to send me! Meanwhile, go to Casual Science right now and get educated! Wow, has it really been three months since I've blogged? Yes, it has, and I'll tell you why. I've been busy with some special UFO projects related to my book that I can't talk about just yet, and I knew that if I kept blogging regularly, I might want to talk about one of my secret projects... so, to ensure that I wouldn't talk about them, I decided to stay away from High Strangeness for the duration. Dr. J. Allen Hynek: Is he thinking about stars, or UFOs? Well, the time has come to take the wraps on Project #1: I've been invited by the amazing Atlas Obscura to give a presentation on Dr. J. Allen Hynek and all things UFO this December 1st. I'll be talking about the trajectory of Dr. Hynek's career, from celebrated astronomer to bad boy on the Air Force's Project Blue Book to culturally-significant UFO authority -- and, yes, I'll be talking about the real Dr. Hynek, not the make-believe Dr. Hynek in the upcoming History Channel soap opera about Project Blue Book. The folks at Atlas Obscura have really outdone themselves, booking the Dearborn Observatory on the Northwestern University campus, the very place from which Dr. Hynek gazed at stars when he taught at NWU! And as a bonus, after my talk we'll have some time to check out the night sky through the Dearborn's 18.5-inch refracting telescope. Can you tell I'm psyched for this? As for the other secret projects, well, I'll be writing about them when the time is right! A few days ago I came across some great news: Calvin Parker, one of the two men who claim to have been abducted by "robotic" beings that took them aboard a UFO and examined them before letting them go, has just published a book about his experience! Do not ever let anyone who looks like this take you aboard his UFO. I am psyched because, as the title of this post tells you, this case, the Pascagoula, Mississippi abduction of Parker and his friend Charlie Hickson, is pretty much my favorite UFO case of all time. I was 13 when the abduction made national headlines, and although I had already read a lot of UFO books by that time, the Parker & Hickson abduction was the first UFO case that I was able to experience in real time, as it was being reported in the newspaper and on the nightly news. And, although I didn't know it then, the Pascagoula abduction was an honest-to-God Close Encounter of the Third Kind! AND it was investigated by my UFO Dad, Dr. J. Allen Hynek, who declared that Parker and Hickson had had a real experience, even if he couldn't explain what it was. It was the first UFO case that felt authentic to me, and it made a lasting impression. Although I failed to score interviews with either Parker or Hickson (who passed away just a couple years ago) for my book, I enjoyed the hell out of researching and writing about the case, and those crazy, crab-clawed beings who "floated" Hickson and Parker into their UFO. It felt just as real to me as it had back in 1973. And now Mr. Parker has gone and written his own book about his experience, and I can't wait to read it! It's been published by Amazon, and you can order it here. Congratulations, Calvin! I'm glad you're finally telling your story! My response was fairly negative, as I know for a fact that the TV show is going to be utter drek, but the guy who posted the tweet vigorously defended the show -- he seemed to basically accept that it was going to be wildly inaccurate, based on what he had seen in the trailer, but said he intended to watch it anyway when it premieres next winter. He then told me that the show's producers were justified in ignoring historical facts because if they were to show Dr. Hynek spending 1948 sitting at a desk reading UFO reports it would be rather dull. I responded that there were actually a lot of exciting and interesting things going on with Hynek's work in 1948, and that a good writer could dramatize anything (never mind that Hynek was working for Project Sign in 1948, and the Blue Book TV series actually starts its story in 1951). Next thing I know, this guy is arguing with me over the actual number of UFO files Hynek investigated for Project Sign in 1948. He said one number. I corrected him. He insisted he was right. On it went for the rest of the evening, neither one of us backing down. He got his number from Hynek's book The Hynek UFO Report, I got my number from Hynek's archives, so who are you going to believe? Anyway, the point is, this guy was really, really concerned that we got the number of cases exactly right, because accuracy was really, really important to him. Okay, I can get behind that -- a lot of UFO fans are sticklers for accuracy, and they should be. Accuracy is a big deal in the field of UFOlogy. We need more accuracy. But here's my issue with that: How does a guy who will argue for hours over the precise number of cases Hynek investigated in 1948 turn around and insist that a TV series that, based on its own trailer, gets virtually every aspect of Hynek's life and work wrong, will be worth watching? Why is a trivial fact treated like a life-or-death matter, but a big lie simply shrugged off? 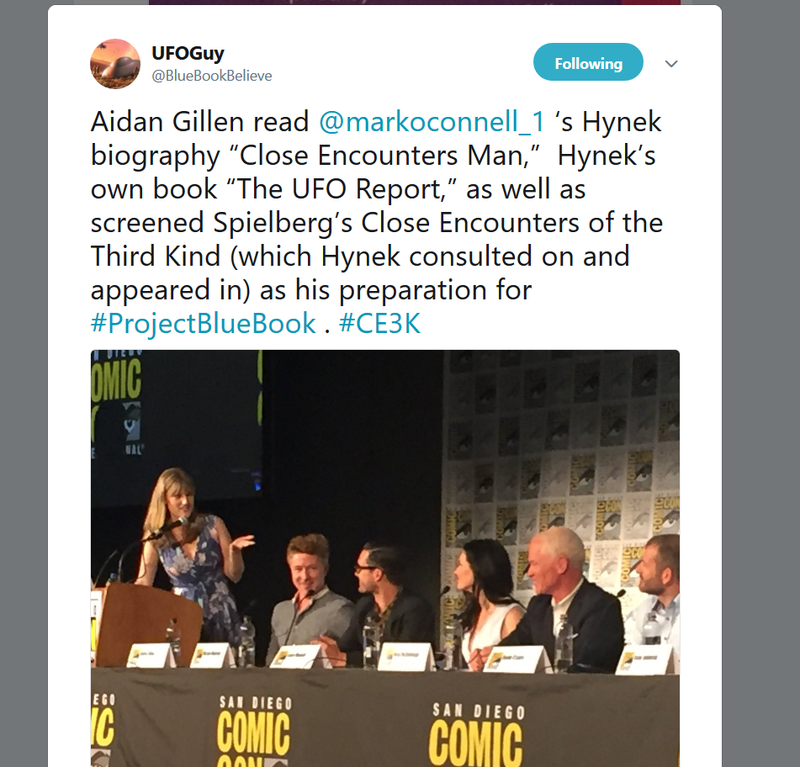 So, I hear that the History Channel put on a big presentation the other day at ComicCon about the upcoming Blue Book TV series, including a big panel discussion with the lead actors, writers and producers. 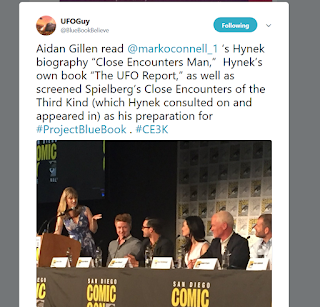 Apparently Aiden Gillen, the actor portraying Dr. J. Allen Hynek in the show, read my Hynek bio The Close Encounters Man, to "prepare" for the role. While I guess it's great that a semi-famous actor claims to have read my book, and I got a free plug in front of the Comic-Con crowd, I'm still PO'd that one of the producers of the show tied to poach research material from me last summer. And now the show itself looks to be absolute drek. What a shame.